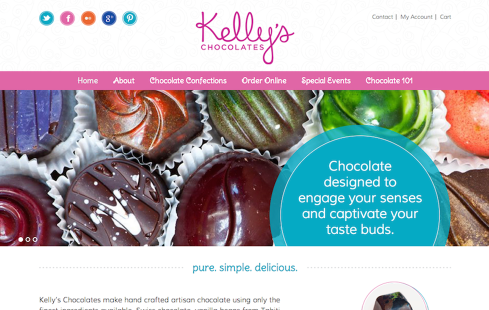 Kelly’s Chocolates are created to engage your senses. From the beautiful design specifically customized to compliment each flavor to the actual flavor that captivates your tastes buds. Kelly’s Chocolates are hand crafted artisan chocolates made from only the finest ingredients available; Swiss chocolate, vanilla beans from Tahiti, fresh fruit puree, etc. All orders are made fresh and are preservative free. This website project included the use of the WooCommerce e-commerce plugin.